In this post I’m going to be reviewing Assassin’s Creed Origins for the PS4. I’m going to try to answer the question: Is it worth the price? I’ve played most of the main Assassin’s Creed games to date. The last Creed game I played was Assassin’s Creed Unity and I didn’t finish it. Now, the reason I didn’t finish Unity wasn’t because I didn’t like the game or because of any of the bugs that were present on release. I simply didn’t finish it because I didn’t have enough free time. I thought the game was interesting and showed promise. I didn’t experience most of the issues I heard other people were having and I would love to get the chance to go back and play that game in the future. I didn’t play Syndicate because I wanted to finish Unity first in case I missed something important to the overarching story. I would say that I guess I’m a fan of the Assassin’s Creed series, but I never get excited for their new releases. I’m indifferent, but I think that’s mainly due to the fact that I wanted to finish Unity before playing a later game in the series. I’ll also admit that I’ve gotten bored of the Assassin’s Creed formula over the years. I remember liking some of the old games, but I wouldn’t want to play them today. Assassin’s Creed Origins was a game that I did not care about at all prior to its release, but then I started to see people tweeting about it, saying how much fun they were having. I got a glimpse of the levelling system and I was intrigued to see how they implemented it. I was interested in the changes in gameplay as well as the story of the origins of the assassin brotherhood. Now I actually wanted to play the game to see what was up, so I requested the game. Thank you to Tom at Ubisoft for sending me a copy. Let’s get into the gameplay. 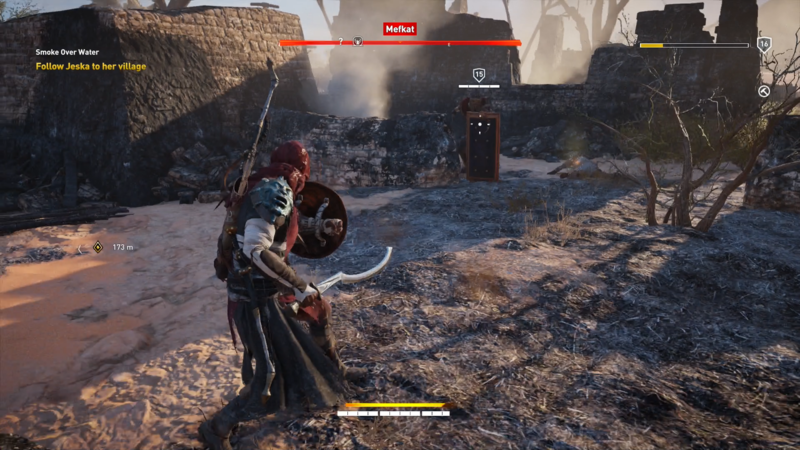 The gameplay in Assassin’s Creed Origins is both similar and different to older Creed games. It’s still an open world sandbox game, this time set in Egypt. There are a bunch of outposts on the map to take out and synchronisation points to synchronise with. But you don’t have to take out outposts OR synchronise. Most outposts you go to will have loot and a captain and or commander to take out. These were fun little challenges as I do enjoy the outpost gameplay that Ubisoft is so fond of. Most of the actual missions direct you to steal something or kill someone. The main character Bayak’s usual solution to problems end up with people dying. Ironically, there’s not as much of a focus on assassinations this time around. I would have preferred some big assassination missions where you had multiple options on how to take out a target, but most of the main assassinations feel like you’re just killing another guard. The auto-travel option on your mount, where you can automatically follow a waypoint, is a welcome addition and deserves a quick mention before we get into the next section. The combat is less reliant on waiting to counter attack your enemies than past titles in the series. There is a much more punishing parry system in its place. You’re able to pick from a selection of weapon types which each have their own fighting styles. There are 7 different melee weapons and 4 different bow types. You can use both your melee weapon and a bow in combat. Different types are better suited to different situations and playstyles. The combat mechanics feel good. The different options you have in a fight are satisfying especially when you’re fighting higher level opponents (the levelling system is something we’ll talk about later). For example, I can assassinate a guard, use my flesh decay ability to contaminate his body and place it at a strategic choke point. Then I can start causing chaos shooting fire arrows into the foreheads of unsuspecting soldiers, leading them to run after me and become poisoned by their comrades dead body before they meet the same fate. We also have a crouch button this time around. Even with the addition of the crouch button, the stealth in Assassin’s Creed is still very bog standard. This isn’t a stealth game. If you play it as one, you will probably be disappointed. The stealth mechanics don’t have a lot of depth and I feel like the intended way to play is to thin the numbers using stealth and then fight in open combat. That play style feels much more satisfying than playing a fully stealth run. Taking out an outpost stealthily is too easy. 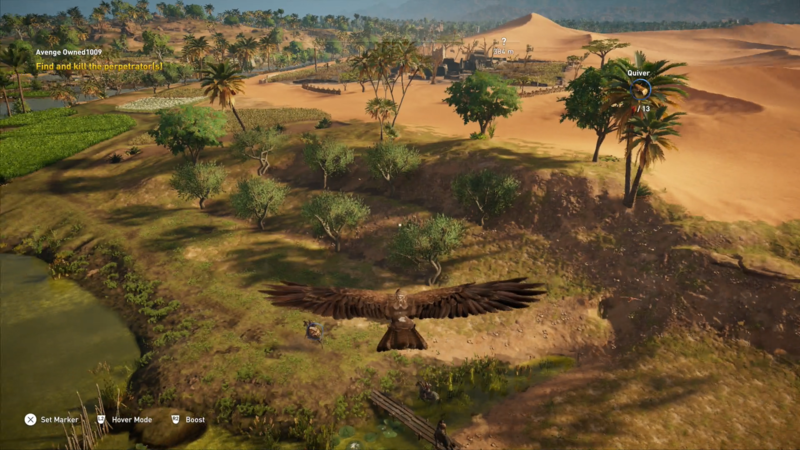 You can spot where everyone is using your bird Senu and then take out everyone one by one. It’s not very interesting gameplay. It was much more fun for me to try to cut a few guys down with my sword after I snuffed out their reinforcements. 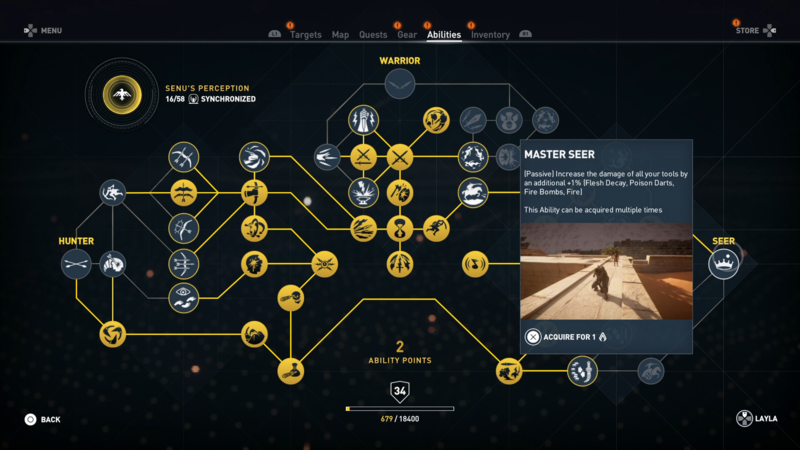 The levelling system in Assassin’s Creed Origins is bad. It seems to lock content from you for no reason other than to increase the length of the game. You gain experience from completing missions and side missions (and probably other activities that I didn’t do). I wanted to play the main missions and a few side missions, but Origins wouldn’t allow me to do that. I was forced to grind through meaningless side missions in order to play the missions I actually wanted to play to progress the game. That’s not to say that the side missions are necessarily bad (we’ll get more into that when we get to the story section), but they quickly got stale and annoying when I was forced to do them. 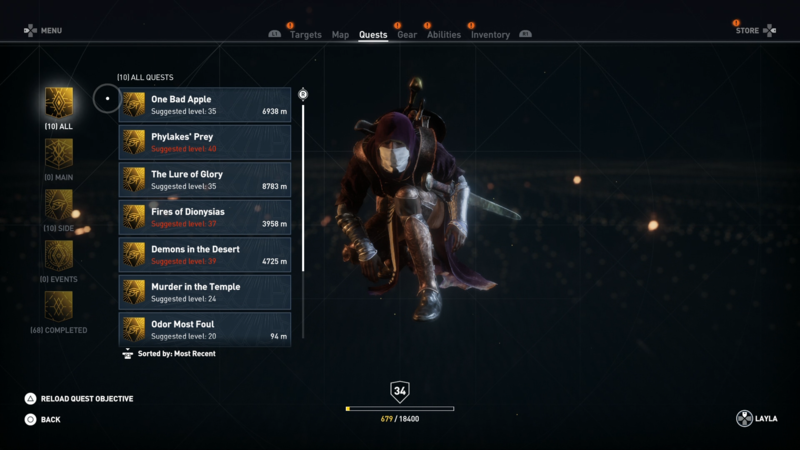 A few of Origins gameplay mechanics are evidently inspired by The Witcher 3. The investigation aspects of the game as well as the emphasis on side missions are the big standouts for me. Side missions are fully voiced and they have stories attached to them, which is great and I congratulate that as it’s a good addition, but the problem is these side missions are all linear and they don’t matter much. In the Witcher 3, a side mission could end in you making a choice that had unforeseen consequences down the road. In Assassin’s Creed Origins you have no choices to make. You can’t affect anything, so these side missions eventually become hollow quests that you complete for the sake of levelling up so you can do the main missions. I wouldn’t have minded doing a few side missions in between missions, but I think the forced focus here really hurts the game. When I thought I was near the end of the game, the next main mission all of a sudden required me to go and gain 10 levels. That was tedious, grindy and unnecessary in a single player game. I’m unsure if this grind was designed to get me to buy better gear in order to speed up the process because I never even looked in the store, but I wouldn’t be surprised if that was the case. The levelling system is also flawed in that higher level enemies become unbeatable. Some enemies have a skull over their heads where their level should be and those enemies are impossible to take down as far as I know. You need to level up to even fight them. Enemies 2 levels higher than you are pretty much sponges and can take you out in one or two hits sometimes. I would’ve preferred if we had a chance to take on higher level enemies and win using skill. Instead I think the levelling system makes higher level enemies too hard and enemies at your level too easy, but that’s my personal preference. You may have a different experience. You are given 1 skill point every time you level up. There are 3 skill trees that you are able to spend skill points in to unlock abilities from. Those trees are Hunter (stealth, assassination and bow abilities), Seer (nature, trade and crafting abilities) and The Warrior (combat and direct confrontation abilities). The skill tree is done well. The abilities are interesting and I was able to unlock most of the abilities I wanted before finishing the story. I was able to cherry pick the abilities that I liked from each skill tree and enjoy my available skill set when playing the game. 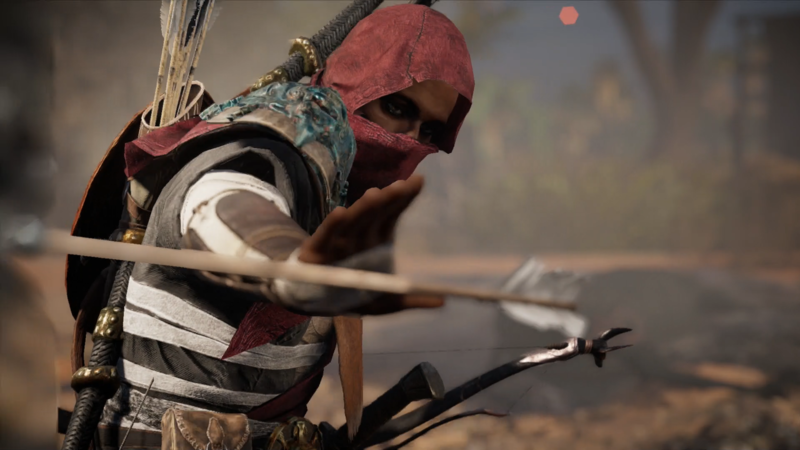 In Assassin’s Creed Origins you play as Bayek, a Medjay of Egypt on a quest for revenge. That’s about all I can say without getting into spoilers. The story isn’t particularly deep or mind-blowing, but the main story of Assassin’s Creed Origins was interesting. 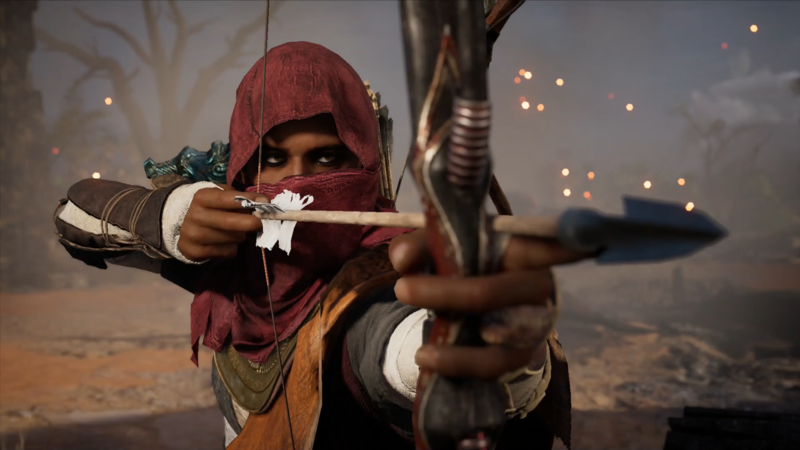 I was intrigued to find out how the Assassin’s Brotherhood was formed, and I was also interested in the personal story of the main character Bayek. The story kept my interest through to the end, although I think it could’ve have lost some of the later sections and been a smoother experience. This game, as many in the series have, inspired me to scroll through Wikipedia and research Ancient Egypt and the historical figures that appear in the game. Any game that inspires you to get educated gets points in my book. The graphics in Assassin’s Creed Origins are good. I have no complaints there whatsoever. The sound was also pretty good, so there’s not much to say here. Assassin’s Creed Origins is currently £32.00 on Amazon. If you want to take your time with this game, then there is a lot of content here for your money. There are a variety of cities on the map that I didn’t even visit while I completed the story. There are also pieces of DLC coming and free end game battles for you to tackle after you complete the story. The game is grindy and it does force you to do side content even if you don’t want to. However you probably aren’t playing this game with the intention to review it, so you’re more likely to take your time and maybe that grind will seem more natural and less grindy for you. I did have fun with most of my time with the game. It ended on a good note, despite the slog just before end of the game. If you don’t mind a bit of a grind, then this game is definitely worth the price. If you’re going to take the game slowly and savour it, then I also think it is worth the price for you. If you’re not a fan of Assassin’s Creed then this might have enough changes to bring you into the series, but it’s still Assassin’s Creed at it’s heart. This verdict was difficult for me because I enjoyed the game and it has a lot of content, but that end game grind really rubbed me the wrong way. However before that grind kicked in (and after) this game gave me hours of fun, so it is worth the price. If you want to buy Assassin’s Creed Origins then please use this link. It will help out the channel at no cost to you. Thanks for reading, let me know what you thought of Assassin’s Creed Origins in the comment section below. 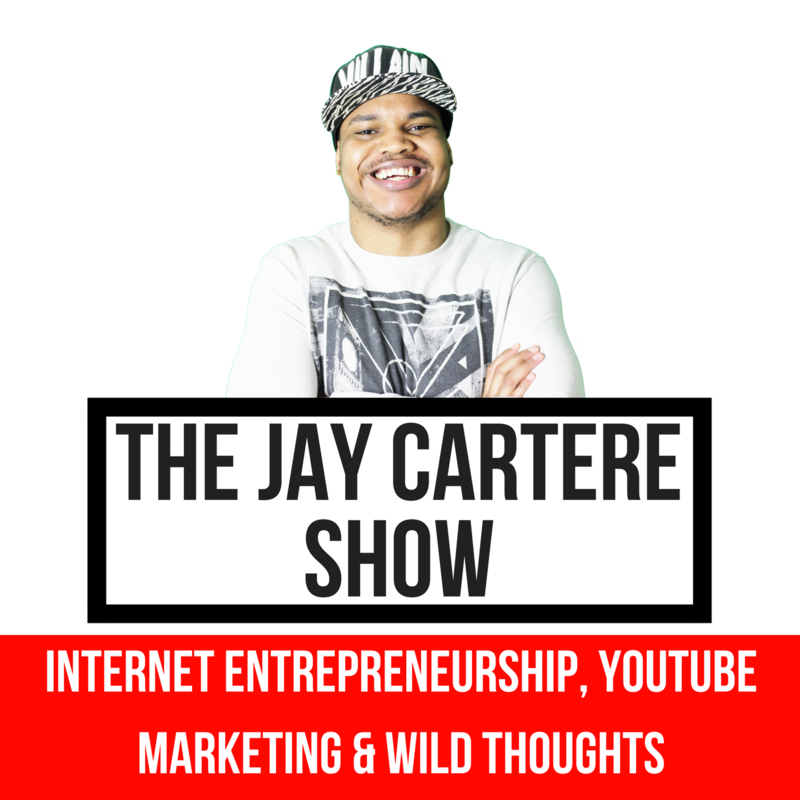 If you want to check out the rest of my reviews, you can click on this playlist. I’ll see you in the next review!